Aztek Fencing mixes it own concrete on site! One of our fencing rigs is pictured above. For a complete turn-key fence project, contact Aztek Fencing today! Does Aztek Fencing work all year long? Yes, we have the equipment and experienced fence crews to work through the toughest frost and cold. How far will you travel to do a fencing job? Aztek fence contractor crews will travel to most locations in the continental United States, but primarily we travel to Colorado, Wyoming, Kansas and Nebraska. What preparatory work should I do prior to fencing? Before Aztek fence installation, you need to do a little homework on possible restrictions to fence installation based on where you live and what’s already underground where you propose to have your new fence installed. Building codes and local zoning ordinances may restrict your fence installation, both in terms of height and design. You may also need to contact your utility companies to be sure to avoid utility lines. Absolutely! We can tackle all sorts of fencing repairs for you. From broken gates to missing slats or fence post replacement, no job is too small for Aztek Fencing. Give us a call. Do you install horse fencing? Yes! Equine and equestrian fencing is one of our specialties. Aztek is operated by horse owners who know well the concerns and needs of horse, agricultural, and livestock fencing. Do you assist the do-it-yourselfer? I need post holes dug but want to do the rest of the fence work myself. Yes, Aztek fence crews can make short work of any post hole project and offer other fence designs and assistance. Give us a call for more specific information. 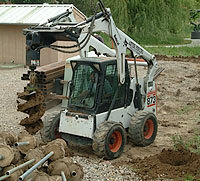 See one of our post diggers at work below. How can I get a fence estimate? Visit the Aztek Fencing contact page or simply give us a call at (970) 235-1207.